Home | Is There Room for Plantations in Fair Trade? Is There Room for Plantations in Fair Trade? When the certifier Fair Trade USA (FTUSA) announced in 2011 that it would split from the international fair trade system and create its own certification scheme, the fair trade movement erupted in controversy. Arguing that it was wrong to exclude hired laborers from the benefits of fair trade, FTUSA’s new standards for the first time permit the unlimited certification of all crops from agribusiness plantations, including coffee. However, largely missing from the rhetoric on both sides of this move was a deeper discussion of the significance of agribusiness plantations. What is their structural relationship to the peasant smallholders who have been at the center of fair trade since its inception? Is there room within fair trade for both small producers and plantations? The “hired labor” form of fair trade was originally intended as a minor supplement to small-farmer production in crops such as tea and bananas. As the international certifier FLO (now Fairtrade International, or FTI) and TransFair USA (now FTUSA) expanded the range of certified products from plantations, however, they also began to argue that this was an opportunity to reform labor practices in the plantation sector. What does “fair trade” mean in the context of plantations? The hired labor standards of both FTUSA and FTI require companies to pay national minimum wages (but not a living wage), allow workers to organize (but not guarantee the presence of independent labor unions), and pay fair trade premiums into funds administered by worker-management “joint bodies.” As of 2012, there were 187,500 hired laborers in fair trade globally, an increase of 46% since 2008. Despite this growth, plantations accounted for only 10% of total fair trade sales in 2012. One reason is that the international standards of FTI still prohibit the certification of several key crops from plantations —including coffee, cacao, sugar, cotton, honey and rice — in order to protect small producers growing these crops. Importantly, these six crops together represent fully 76% of total global fair trade sales. For this reason, the economic stakes around expanding hired labor certification into these crops are very high. They represent a lucrative market for large corporate food firms, who would prefer to receive fair trade certification for their existing supply chains relying on monocrop plantations, rather than having to source them from small-farmer cooperatives. In the U.S., with FTUSA’s departure from the FTI system, their wishes have now been granted. While academic research shows that access to fair trade markets often generates real and even significant social and economic benefits for small producers, the story is different for the hired labor model. The academic literature on the social impact of fair trade on plantations, with a few exceptions, indicates that financial benefits to workers are minimal and sometimes nonexistent, that certifiers do not monitor labor conditions effectively, that “joint bodies” are often unrepresentative and problematic, and that management frequently impedes labor organizing. Crucially, the expansion of fair trade certification into plantations is not being driven by labor unions or labor rights organizations, but rather by large coffee roasters and other retailers, including grocery chains anxious to offer more variety and volume of certified products under their store brands. In order to evaluate the appropriateness of designating plantation production as “fair,” it is important to examine the forces pushing small producers around the world off of their lands. Sociologist Philip McMichael writes that “commercial agriculture and habitat degradation routinely expel peasants … from rural livelihoods.” This process of depeasantization creates a vulnerable wage-dependent labor force in rural areas and fuels migration from the countryside to cities across the global South. The structural adjustment policies mandated by the World Bank and IMF promote monoculture, export-oriented agriculture as the only development strategy for indebted nations. “Free trade” policies also contribute to this dispossession. Finally, the growth of plantations is a manifestation of the “global land grab” — the dramatic increase since 2007 in the purchase and long-term leasing of land in the global South to grow monocultures of food and biofuel crops, almost always without consulting the inhabitants. This land — at least 100 million acres to date — is being acquired for extremely low prices by hedge and equity funds, investment banks and some national governments. As a result, millions of peasant farmers are being displaced from their lands and homes. To be clear, the point is not that plantation agriculture is not in dire need of strict regulation and reform of its labor and environmental practices. Quite the contrary: conditions on plantations are often highly abusive. However, a fair trade system whose foundational goal is to create greater social and economic justice for marginalized small producers cannot simultaneously be the vehicle for placing a stamp of approval on slightly less-exploitative practices by agribusiness corporations and local elites. Independent unions and strong public regulation are vital to curtailing labor rights abuses in agribusiness, and a separate certification for plantation products could also be a useful option. However, the same fair trade seal used to protect democratically organized small producers, and to make that clear to consumers, is not the appropriate tool to accomplish this goal. U.S. consumers who want to know that their fair trade purchases are supporting small producers now have both new challenges and new options. With FTUSA’s departure from the FTI system, there is no longer any way to know whether its certified products come from plantations or democratically organized farmers. The Fairtrade America seal, which applies the standards of its parent FTI, at least ensures that several major crops come exclusively from small producers. Finally, the new Small Producers’ Symbol (SPP) is placed only on goods from small-producer organizations. Despite the conflicts that have shaken the movement and split the certification system, the fair trade model continues to help sustain organized small producers and their communities across the Global South. Yet there is more need than ever for truly fair trade. 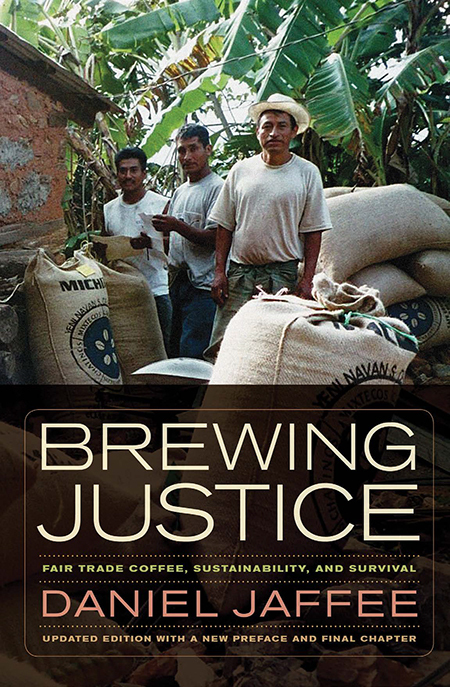 Parts of this article are excerpted from the 2014 updated edition of Daniel Jaffee’s book, Brewing Justice, with permission from the University of California Press.